Scott Pilgrim vs. The World and Shaun of the Dead director Edgar Wright says that he is "passionate" about making an Ant Man movie, and that his script has an espionage angle to it. As superpowers go, shrinking yourself to the size of an insect and having the ability to talk to ants isn't quite in the same league as being able to fly, or having laser vision. Some would say it's not even in the same league as having a sock with a pool ball in it, a power that isn't particularly super at all. Edgar Wright is not one of those people however, and says that in his Ant Man movie, people would get to see just how useful shrinking powers are. Of course the movie doesn't - and may never - exist, but Wright says he has a script ready, and plans to start working on a second draft soon. In his mind, the reason that shrinking powers seem so lame is that every movie that has depicted them, from Honey I Shrunk the Kinds to The Incredible Shrinking Man depicts the "shrinkee" as being in danger, and rarely shows them changing size voluntarily. His script, on the other hand, is a "high-tech spy heist film with somebody with a very particular power." 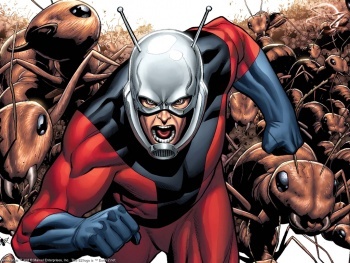 Ant Man is the kind of character you can get away with playing around with a little, largely because not a huge number of people know who he is. With so many superhero movies coming out over the next few years, it would make a refreshing change to have one that's just a little bit different.